A proxy server passes requests between a client and server. It is sometimes necessary to use a proxy server to reach a network (as a security measure, for example). Because of this, all network-enabled software can be configured to use a proxy server. The relationship between clients and servers via a proxy server can be one-to-one, one-to-many, many-to-one, or many-to-many. By default Hoverfly starts as a proxy server. 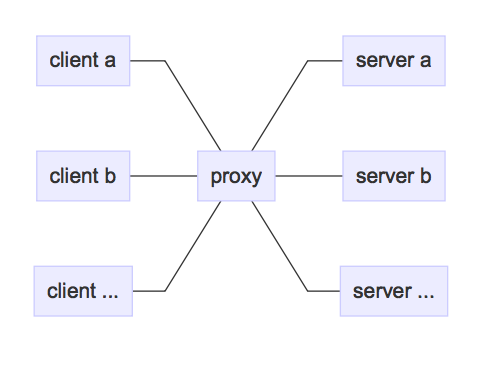 Launching network-enabled software within an environment containing these variables should make the application use the specified proxy server. The term should is used as not all software respects these environment variables for security reasons. Alternatively, applications themselves can usually be configured to use a proxy. Curl can be configured to use a proxy via flags. The proxy configuration methods described here are intended to help you use the code examples in this documentation. The method of configuring an application or operating system to use a proxy varies depending on the environment. A proxy server is a type of webserver. The main difference is that when a webserver recieves a request from a client, it is expected to respond with whatever the intended response is (an HTML page, for example). The data it responds with is generally expected to reside on that server, or within the same network. A proxy server is expected to pass the incoming request on to another server (the “destination”). It is also expected to set some appropriate headers along the way, such as X-Forwarded-For, X-Real-IP, X-Forwarded-Proto etc. Once the proxy server receives a response from the destination, it is expected to pass it back to the client.